Savannah Morgan had high hopes. She dreamed of becoming a writer and escaping her South Caroline town, where snooty debutantes have always looked down on her. But at twenty-four, she's become a frustrated ex-cheerleader who lives with her mother and wonders if rejecting a marriage proposal was a terrible mistake. Then Savannah's world is shaken when she learns the father she never knew is Edward Stone, a billionaire media mogul who has left Savannah his fortune on the condition that she move to Manhattan and work at his global news corporation. Putting aside her mother's disapproval, Savannah dives head first into a life of wealth and luxury that is threatened by Edward's other children - the infuriatingly arrogant Ned and his sharp-tongued sister, Caroline, whose joint mission is to get rid of Savannah. She deals with their treachery along with her complicated love life, and she eventually has to decide between Jack, a smooth and charming real estate executive, and Alex, a handsome aspiring writer/actor. Savannah must navigate a thrilling but dangerous city while trying to figure out what kind of man her father truly was. In many ways, New Money reminded me of how I feel when I watch Gossip Girl. I can't help rolling my eyes at some of the over-the-top drama and selfish characters... but I also kind of enjoy losing myself in the story. It can be so addicting! There were a lot of elements in New Money that made me think of the TV show, but it didn't leave me wanting more the way I do when I watch the show. Unfortunately, I had some issues with the book that kept me from really loving it. Savannah is a Southerner - something that had me excited to read this book. So, I was really disappointed in how stereotypical the Southern elements of the book felt. It didn't ring true to me, and I didn't particularly like how redneck and ridiculous the South seemed. Maybe I'm extra sensitive to it because I've lived here all my life? Either way, I didn't find myself connecting to anything about the way it was portrayed in this book. I also struggled with how unlikeable the characters are throughout the book. Everyone felt a bit one-dimensional, so I wasn't able to really overcome my dislike of them. I can't quite put my finger on it, but I just really struggled with the people in this book. Like the portrayal of the South, the characters seemed like stereotypes or cliches in too many instances. All that being said, it was a fun read. I loved that it's set during that time after college but before you're really settled. And I actually enjoyed the drama in the plot because it was a nice change of pace. It wasn't quite right for me, but I can still see a lot of readers enjoying this rags-to-riches story! "I'd been taught good manners, too. I'd just been pushed far enough today to forget them." *After writing several mini reviews, I decided to note the difference by calling it "Brief Thoughts" on the book. I'll continue to use this moving forward whenever I write a shorter, less in-depth post on what I've read. I liked giving myself the freedom to write less and want to continue to do so when I feel I don't have a lot to say. New Money sounds like the kind of book that's pure entertainment for me. Even though it might be filled with OTT scenarios and a touch too much drama, sometimes, that's just what I feel like reading! I'm sorry to hear that the representation of someone from the South is a little cliche though, especially since that element could have been the one to reel you in. Yes! That's exactly what it is - so fun, totally entertaining, and something you can totally be in the mood to read. It was hard because I really loved certain parts of it and then found others frustrating enough to be just okay about this overall. I know what you mean about stereotypes regarding place. I'm don't live in the South, I live in Central New York. Which, admittedly, is almost never the setting of any books (except Speak by Laurie Halse Anderson! ), but I always get frustrated with how people think that all of New York State is like NYC. Because, seriously, most of NYS is NOTHING like NYC. Not that NYC is bad, because it's not. Anyway, sorry this book was a bit of a let down. Hahaha! YES EXACTLY. It's not there's no part of the South that's the way it was depicted in the book - just that overall it ended up seeming so cliched. It's hard when you're familiar with a setting/topic/etc. and are more critical of the way it's done in a book. 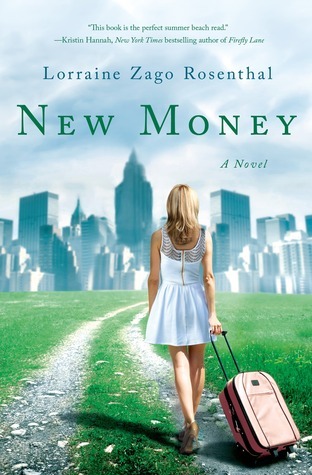 I went into New Money with such high expectations; I loved the author's YA book and I thought the premise for New Money was such a good one, but I was really disappointed. I completely agree with you about the characters being cliche and one dimensional. I don't really think anything about the NYC stuff was inaccurate, but it was definitely pretty cheesy and I couldn't relate to it at all, despite having lived in NYC for six years (although, sadly, never with very much money!). I've seen this one before and wondered about it! I OF COURSE loved the Southern aspect of it and wondered how it would spill over into the "big city-ness" of the book because Southerners are often portrayed...not very well. So I think you've answered the questions I have about this one BUT you've also made it seem like a palate cleansing read. I'll have to watch for it maybe at the library in case I need something like that (I do love Gossip Girl even as I roll my eyes at it).